69% of the men surveyed consumed something high in sugar and/or sodium in the past day, significant because men are 57% more likely to die from diabetes than women and 79% more likely to die from heart disease. 59% of men surveyed did less than 30 minutes of moderate to vigorous activity—the recommended daily amount—in the past day. This may be part of the reason 67% of Canadian men are overweight or obese. 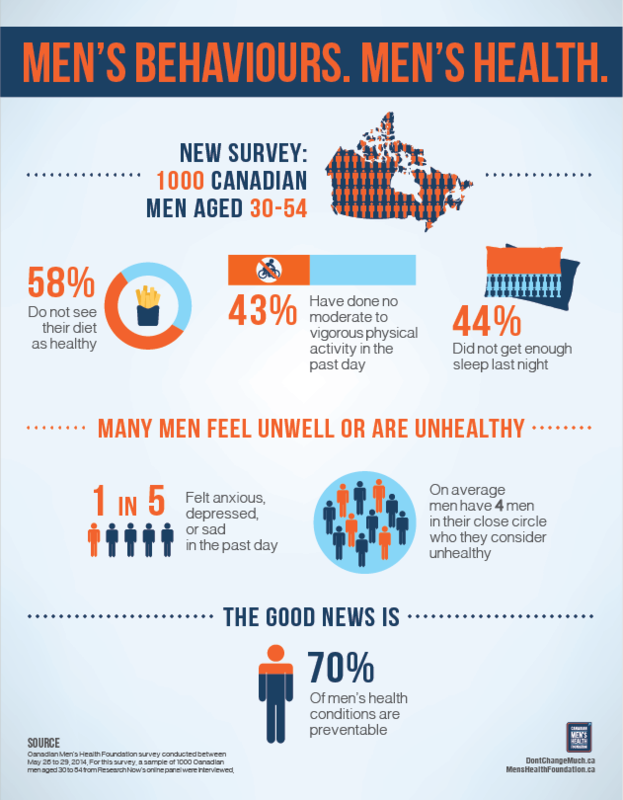 Goldenberg says, “We need to get men thinking about their health, and making small changes that become habits, that become a healthier lifestyle.” These are the findings of a Canadian Men’s Health Foundation survey conducted between May 26 to 29, 2014. For this survey, a sample of 1000 Canadian men aged 30 to 54 from Research Now’s online panel were interviewed. The sample was stratified and weightings were employed to balance demographics, ensure that the sample’s composition reflects that of the male population according to Census data and to provide results intended to approximate the sample universe. The survey was offered in English and French to ensure wide inclusion of the Canadian population. While sampling error cannot be estimated for non-probability samples such as the sample used to conduct this survey, a traditional un-weighted probability sample of comparable size would have produced results considered accurate to within plus or minus 3.1 percentage points, 19 times out of 20.